Three things come to mind when we think of fall: boots, boots, and boots. Call us obsessed, but how could you not be when there are patent-leather combat and suede over-the-knee styles to be worn? It’s not uncommon for us to slip on our boots the moment the temperature dips below 70, and for all intents and purposes, they’re the only shoes we want to wear throughout fall. This season, we’re styling our preferred footwear with shearling jackets, high-rise jeans, and plush, cozy sweaters. And since boots pair so well with dresses—of all lengths and styles—we’ll be pulling those from our closets, too. From a slim ankle bootie to a lug-soled lace-up pair, these are the five fall boots we want right now. 1. Stuart Weitzman The Allhyped Boot: When it starts getting cold, one of my favorite styling tricks is wearing thigh-high boots instead of pants or leggings. (I promise they’re often a warmer alternative!) These give me go-go dancer vibes, which I am all about—so in addition to looking great, they’re probably perfect for dancing, too. 2. 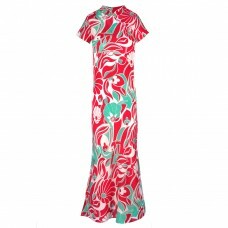 Rixo London Bianca Dress: I don’t wear dresses too often because I prefer layering separates, but Rixo makes every dress a statement by combining unexpected patterns and colors. I love the high collar and red swirls on this one. It’s made to be paired with those Stuart Weitzman boots! 3. HAH Queen 4 a Day Dress: This piece represents one of my favorite way to style tall boots—with something super short. Boots give this otherwise romantic dress a rocker edge. I feel like I could see Debbie Harry in a similar look, and I’m never not trying to channel her. In other words, I’m sold. 1. 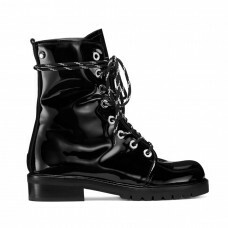 Stuart Weitzman Combat Boot: I love a good classic combat boot, and even better when it’s fun patent leather. 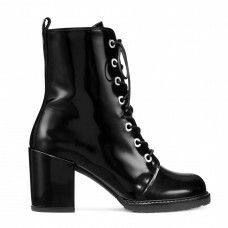 These would be perfect for iffy NYC winter weather (patent leather secretly is great in surprise snowstorms because it doesn’t really stain) and would look just as great with a swingy midi dress as with a pair of cropped jeans. 2. Citizens of Humanity Jeans: I just got these jeans, and I’ve been wearing them multiple days in a row. They’re perfect—comfortable, flattering, well-made (they don’t get all baggy and weird the more I wear them), and it’s easy to make them look dressed up (yes, even with the knee rips) or more casual. They’re my new favorites. 3. 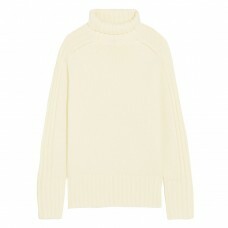 Joseph Sweater: My ultimate go-to in winter is a cozy turtleneck, cropped jeans, and flat boots. Just looking at these three picks makes me feel more comfortable and excited for fall! 1. Stuart Weitzman The Tieland Boot: I’ve wanted these babies for so long, since I know for a fact they fit perfectly and look great on petite humans (which, trust me, isn’t easy to find when it comes to over-the-knee boots). But rather than go with black, I’m leaning toward a light, neutral shade, which will likely pair well with more outfits while working its magic to elongate my legs. 2. 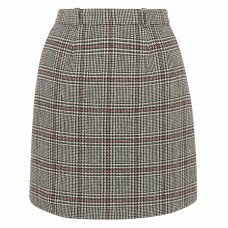 Carven Skirt: Over-the-knee anything pair well with minis, and I’m currently stocking up preppy plaid patterns at the moment. Plus, since my boots will cover so much leg, I won’t have to wear tights—even in the depths of winter. 3. 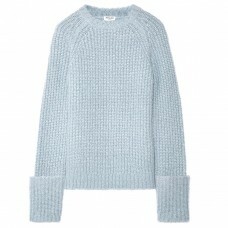 Frame Sweater: This light blue sweater looks pretty darn comfy (it’s alpaca, after all), and paired with my light-colored outfit, it will no doubt help me attain some sort of Clueless vibe...which is always a plus in my book. 1. 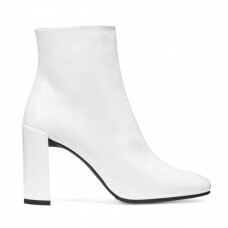 Stuart Weitzman Vigor Bootie: I’m loving white boots at the moment, and anything patent immediately catches my eye. Plus, the block heel on this Stuart Weitzman pair is super on-trend for fall, and even though I’m 5'9", I’ll always take a few gratuitous inches! 2. 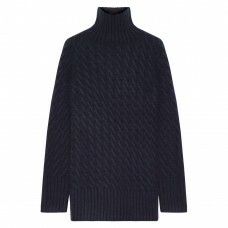 The Row Landi Cable-knit Cashmere Sweater: Colder weather means I can have more fun with textures, and this classic cable-knit sweater from The Row hits every mark for me—cozy with the perfect amount of slouch. You’ll find me working and napping in it until spring rolls around. 3. Joseph Den Cropped Leather Pants: I’ve spent season after season debating whether or not to invest in leather leggings, but they always seem too restrictive. Enter this straight-leg pair from Joseph. The silhouette is my absolute favorite for pants lately, and they’ll contrast beautifully with the oversized cashmere turtleneck. 1. Stuart Weitzman Climbing Boot: I like combat boots but have yet to find a pair that I can dress up and down…until now. They have all the trappings of a classic combat style—lace-up, lug sole—but with shiny leather and a great chunky heel. They’re divine. 2. Veronica Beard Aubrey Ruffled Tech-Knit Mini Dress: I wear short dresses year-round, opting for knit styles when the temperature starts to drop. I enjoy pairing frilly pieces with items that skew more hard and edgy, so I’d definitely wear this dress—and its perfect ruffles—with a boot. 3. Coach Western Aviator Jacket: I’d do a lot for this jacket—more than I’m willing to admit publicly. I’m completely sold on the purple and cropped silhouette, and the shearling is too good. The fact that it’s probably incredibly warm is an added bonus.